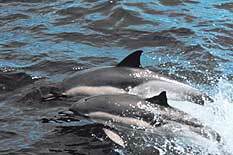 Two common dolphins. Photo courtesy of NOAA Fisheries. The short-beaked common dolphin is the most numerous dolphin species in the offshore waters of the Atlantic, Pacific, and Indian Oceans. The long-beaked common dolphin has only recently been recognized as a distinct species, and is only commonly found within about 50 miles of the coast from Baja California to central California in the eastern North Pacific. In all oceans, common dolphins occur in tropical and warm temperate waters, often in very large groups of many hundreds, if not thousands, of animals. Common dolphins are fast and energetic swimmers. They are frequently seen bowriding in front of boats and performing jumps and leaps above the water surface.Common dolphins have sleek bodies that average 2.3 m (7.5 ft) in length. The distinguishing marks of the common dolphins are consistent across species. Common dolphins have a clear separation between the rostrum and melon. There is a black pattern on the top of the body that comes to a point on the flank below the dorsal fin. This pattern is often called the “saddleback.” The sides of the dolphin have a crisscross, hourglass pattern that appears yellowish towards the front and gray towards the back of the animal. The most common sounds heard from common dolphins are tonal whistles (maximum frequency below 50 kHz) and high frequency echolocation clicks (above 100 kHz). 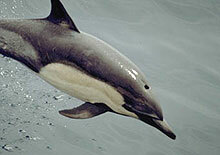 Common dolphins have not been shown to use individually distinctive signature whistles like bottlenose dolphins. However, whistles from groups have been shown to be unique to that group. Close-up of a Common Dolphin. Photo courtesy of Scott Hill, NOAA, National Marine Mammal Laboratory.